My 18 month old son Jake makes a perfect Lorax. His grandmother made this costume at my request. It is made from orange fleece. Details on the hat include yellow foam and braided yarn for the eyes. His Truffula tree is made from a back scrubber from the dollar store with a yellow boa glued to the sponge. I painted a small bucket gray with the word "unless". I think it turned out really cute! I absolutely love it! Is there a link on how to DIY, or would you happen to make one to sell? 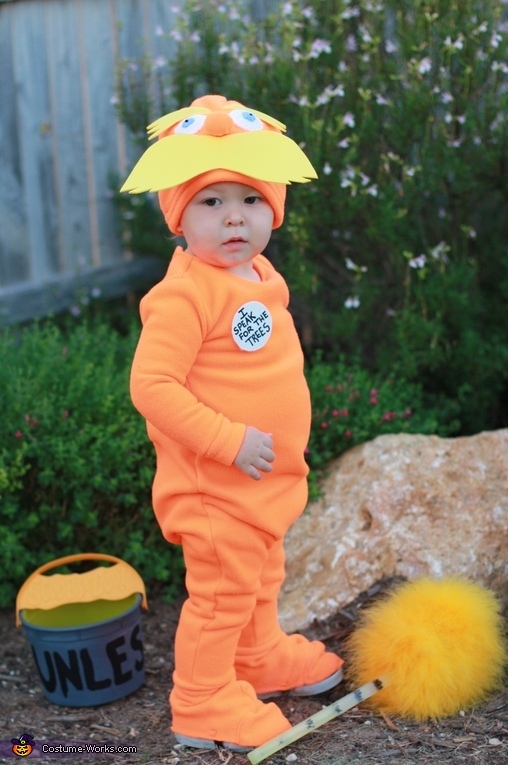 I NEED one of these for my granddaughter she is absolutely obsessed with the Lorax. She is 10 months old and wears size 12 mo maybe 18 months for a costume as she would need to be dressed warm under it. Any possibility you would make one to sell? Depends on what shipping would cost but I would be willing to go 25-30$? you let me know if that's enough and what shipping costs would be. thanks So much!! Anyway I can get this outfit? Still for sale by chance? I'll buy! Any chance this is still for sale? Or would someone make it to sell? I would love this for my 18 month old!! Thanks for all the comments, my mom made this for my son 5 years ago! I passed it on to someone in another state the following year. It would be pretty simple to recreate. Orange sweat suit, and hat. We used Stiff felt or foam from the craft store for the mustache and eyebrows, and the eyes and glued them all to the hat. The Truffula tree is a long handled loofa from the dollar store with a feather boa glued to the top. His bucket I spray painted one from the dollar tree and wrote “unless” on it.